To celebrate the end of the 2013 we wanted to give tribute to an icon with a penchant for color. David Hockney, born 1937, is an English painter who has created extraordinary landscapes, portraits as well as opera sets. His work is stamped with expressive color and attitude. Hockney's recent paintings are currently on exhibit in San Francisco at the De Young Museum in San Franciso, In David Hockney, A Bigger Exhibition, feature groves of trees threaded through with open paths. But the unnatural hue of the bark and undergrowth places these forests in dreamland, through the looking glass, on alien and yet familiar lands. His paintings often depict receding landscapes, with empty paths diverging in woods of riotous color. Since this is our last post of 2013 and we wanted to spend it reminding ourselves of why just why we love color. 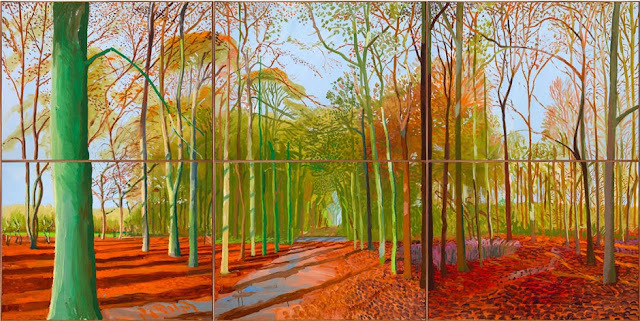 Fortunately, Hockney's work not only uses great color but it also thinks about our relationship to color as well. Take these three paintings. You can almost see yourself there, at that exact point in that exact forest. That one thick green tree in the foreground, its lowest branch growing bent, anchors you in that place even as the colors and vibrancy shift from image to image. These three paintings, each with its own inviting path, are a stunning example of Hockney's colorist prowess. Each place is changed not by rearranging the physical space but solely with shifting color. More than just changes in season the forest in each painting grows in a different climate, maybe even on a different planet. 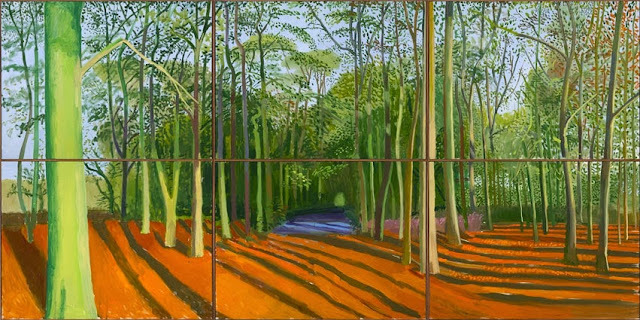 In Hockney's paintings color becomes the content, the main idea, of the painting. These painting say something about the lens through which we see the places we inhabit. That place, the atmosphere, the way it makes you feel, the way it effects your mood and heartbeat and stress level, all of that is influenced by color. So what do you think? 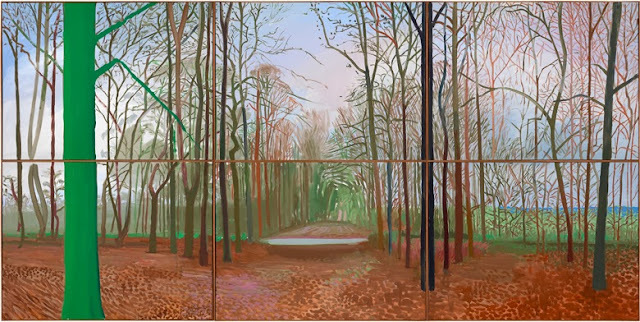 Can we see and make our spaces, and by extension the events that happen there, not grey and concrete rough but brushed as Hockney's forests with world changing color?